I have a soft spot for Pontiac GTO's that came about from the movie 'My Science Project'. The one in the movie is a '69 but it got me looking at GTO's and when I saw a 1966 model I knew that was the one for me. Everything about the '66 is cool. From the grille to the wheels to the bonnet scoop. There were 96,946 '66 GTO's sold which is meant to be the highest ever numbers for a 'true' muscle car. 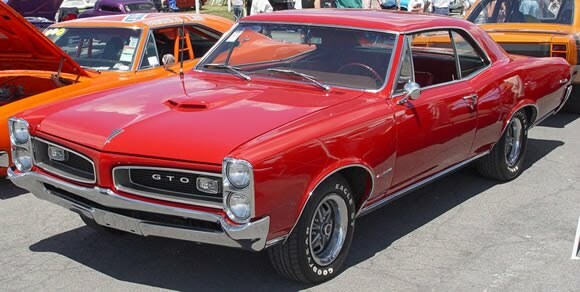 This model GTO had three motor options, all V8's. A 389 with 335 bhp, a 389 V8 360 bhp and a 389 V8 Ram Air with 360 bhp. Performance for the 389 with 360hp was 0-60 in 6.5 sec and 1/4 mile in 14.65 sec @ 98mph - excellent! A beautiful muscle car that has a place in my garage. More info about GTO's here and a cool restoration project here.